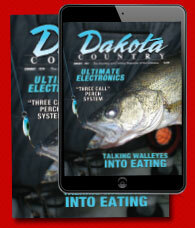 Welcome to Dakota Country Magazine... The Hunting and Fishing Magazine of the Dakotas! Editorial content follows any and all hunting/fishing seasons. 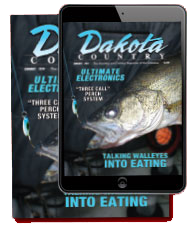 The following is just a guideline as Dakota Country Magazine covers all aspects of hunting, fishing, camping and outdoor related content through-out the year. The editorial scope listed below is a guideline strongly recognized and followed by the accomplished staff of Dakota Country Magazine writers. APRIL SPRING SPECIAL FISHING BOOK: Editorial Focus mainly on open water fishing season as well as spring hunting seasons such as turkey and the spring light goose conservation order. MAY ISSUE: Editorial Focus of open water summer fishing and spring turkey hunting. JUNE ISSUE: Mainly open water fishing. JULY/AUGUST Combined Edition: Main focus on open water summer fishing season. SEPTEMBER FALL SPECIAL HUNTING BOOK: Editorial Focus switches gears to the upcoming fall hunting seasons as well as late summer and fall fishing. OCTOBER EDITION: Editorial focus on hunting such as pheasant, duck and deer and fall fishing. NOVEMBER DEER EDITION: Editorial focus on hunting, particularly deer with fall fishing with a couple ice fishing articles. DECEMBER ICE FISHING EDITION: Focus switches to mostly ice fishing with last season hunting opportunities. Thank you for your interest in Dakota Country Magazine... The Hunting, Fishing and Camping Magazine of the Dakotas! Thank you for supporting hunting, fishing and camping.